Last week, I was lucky enough to host Paolo Bacigalupi at my school. He addressed a crowd of mostly high school students, and he, not to put too fine a point on it, rocked. He was kinetic and energetic, brought the audience right in, and had lots of interesting things to say. 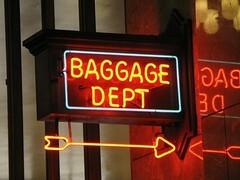 And while I could devote a whole post to the awesomeness of the visit, what I really want to talk about is a very particular brand of baggage. Last year, Sarah and I gave some thought to baggage, and ultimately concluded that it’s all ok because the committee ameliorates the idiocy of the individual. We were looking at the baggage a reader carries, which is the obvious one. But there’s also the baggage that the author brings on board.